I know that letter carriers face a lot of difficulties in their daily rounds. This video shows that, though dogs have a storied reputation for bothering our postal workers, cats can prove a formidable foe to timely letter delivery! Be like this kid and write a creative thank you note today! Let your inner overlord loose! Designer Reuben Miller shared some funny ideas for extreme repurposing (poking fun, it seems, as the repurposing/upcycling trends of late) on his wonderful blog. 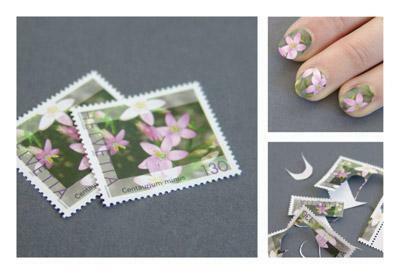 One of his crazy ideas involved repurposing stamps as nail decorations! It’s actually a fun idea for some of the great stamp designs we’ve had lately. I think the Garden of Love stamps might be perfect for this. Thanks, Allison, for pointing me to The Improvised Life‘s post about this crazy idea! Wish I’d had the chance to see one of these when they came out in 2007! I was catching up on Jon Stewart last night on the DVR and saw his take on Claire McCaskill’s recommendation to the Postmaster General that the post office start a letter writing campaign to make up some of their devastating losses. Stewart had his typically hilarious take on the whole thing. I was going to blog about this, but then saw that Viva Snail Mail had already done so and Melissa at VSM had a great idea. She suggests that we send Claire McCaskill a thank you note for her support of snail mail. What a great idea! Then Sharon–a reader of both of our blogs–had another great idea, send Jon Stewart some snail mail love, too! Pop on over to Viva Snail Mail to get both addresses and send your notes out today! Mine are already in the mail. “I bought a doughnut and they gave me a receipt for the doughtnut… I don’t need a receipt for the doughnut. I give you money and you give me the doughnut, end of transaction. We don’t need to bring ink and paper into this. I can’t imagine a scenario that I would have to prove that I bought a doughnut. To some skeptical friend, ‘Don’t even act like I didn’t get that doughnut, I’ve got the documentation right here… It’s in my file at home. …Under “D”. This afternoon I was out on my deck reading a great article in Esopus on Ray Johnson, the father of mail art, when from the sky fell a cute little albino caterpillar. I snapped a few pics and mentioned to Kris that this caterpillar was a bit “over the top,” like a drag queen of the caterpillar world. Kris said, “it looks like Phyllis Diller”…and Phyllis Diller Caterpillar was born. Having just enjoyed this video (warning, adult language not appropriate for work or children) from Jenny Lawson at The Bloggess about the importance of being silly and sharing the fun, I thought the picture was worth sharing with you. Hope you’re all having great weekends. Now go outside and play! P.S. Hat tip to Melissa at Viva Snail Mail for pointing me to the Esopus article on Ray Johnson. The magazine is amazing and the pull-out recreations of some of Johnson’s mail art are worth the price alone. I think I’ve only posted one fun letter from the past here on Save Snail Mail (and that letter was courtesy of Laura doing historical research in England). I love perusing old letters and hope to post others as I find them. But a great blog regularly posts letters that provide insight into the lives of famous people. It’s called Letters of Note and the blog features original letters (and, thankfully in many cases, transcriptions) from notable figures like a love struck teenage Michael Jordan or a late-rent-paying Bruce Springsteen. Check it out and let’s all thank Allison for sharing the link!